For as long as my father's Aunt Patty was alive, we would always go to her home in Manassas, Virginia on Mother's Day where she would fix the tastiest of meals for a huge family reunion. What a wonderful family tradition it was. Before leaving to go there, I can remember my parents cutting white roses out of the yard to wear on Mother's Day. Somehow I had forgotten this meaning of wearing white flowers or associating white flowers, be it roses or carnations, to signify mothers who were no longer living. 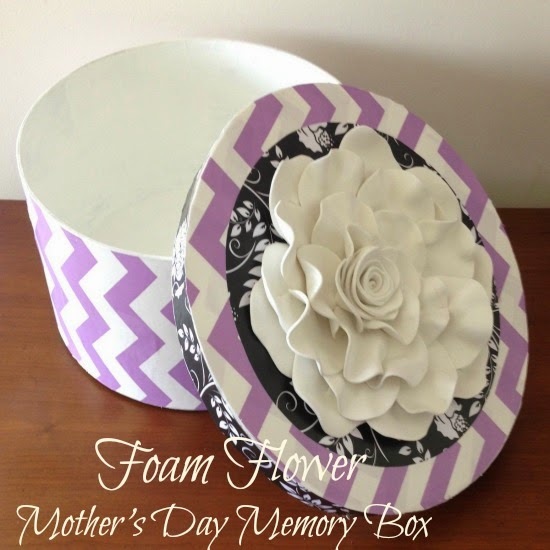 For Mother's Day this year, I made a memory box to hold some of my mother's treasured items . . . a handkerchief - one of many she would keep with her daily, favorite pieces of jewelry, my parents' marriage certificate, one of my brother's locks of baby hair, and special photos with descriptive comments written by my mother. The paper mache box I made is decoupaged with wrapping paper and scrapbook paper and adorned on top with an awesome white flower I created using foam sheets and an iron. It was so easy to make. 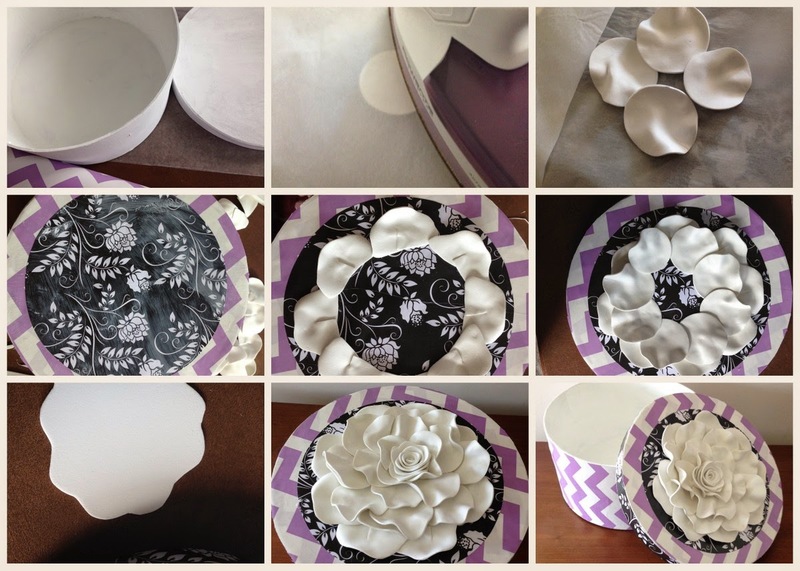 I painted the paper mache box and top with white acrylic, inside and out. After drying, I painted on mod podge and added the sized wrapping paper to the sides and top. I trimmed the edges of the top with a black print of scrapbook paper. I made a serious mistake when I applied the mod podge to the top of the paper. I didn't realize I had picked up the white paint sponge brush instead of the one I used for the mod podge. Unknowingly, I painted a combination of acrylic paint and mod podge on the first layer of paper. I discovered my mistake when I wondered why the mod podge wasn't drying clear. Silly me! Fortunately, I did this just to the top. I re-covered the top with the same wrapping paper but didn't have enough of the original black and white print scrapbook paper for the edge, so I had to pick another black and white pattern. For the flower, I cut out foam circles using a circle punch. I ironed the circles between parchment paper and held them with my fingers to shape and cool. After cooling, I cut the circles in half and hot glued them in a large circle pattern on the top. I continued gluing the half circles til reaching the center. For the center of the flower, I cut out a wavy edge circle swirl and rolled the strip to make a flower which I glued to the center. I think this Mother's Day Memory Box turned out better than I could have imagined. The flower actually looks like porcelain. What better way to hold a few memories of a lifetime from my mama. I do hope I've inspired you to want to make one too! that is beautiful, you really are rocking that foam at the moment. I swear I need to give it a try when I next have a minute. What a beautiful box for those memories. I have a store-bought box for my mother's memories, but this is so much more personal. I love the foam rose! 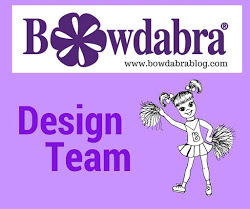 I might be the last one on the block to find out that you can iron and shape fun foam, but I have some foam and parchment paper in my craft room and I might have to try this today! Love those chevron stripes. It's perfect combined with the black and white print. You brought a memory back of church on Mother's Day handing out red and white carnation corsages. I am glad someone else thinks an iron is for crafting. Love how real the flower looks and the box is beautiful. Looks fabulous and I adore the rose. Thanks tons for linking to Inspire Me. 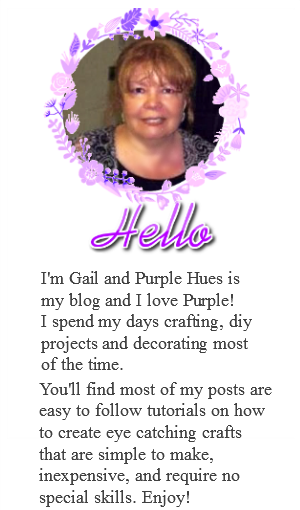 Absolutely gorgeous Gail! 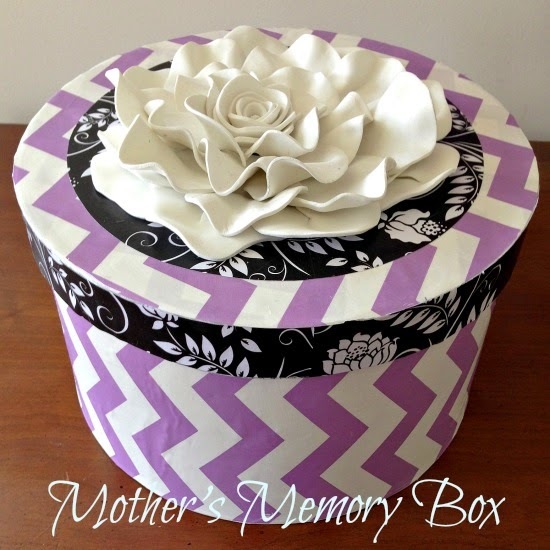 I love the purple chevron with the floral pattern, and that flower is amazing! Very Pretty!! you did a fabulous job on the flower! I had never heard of the white flower tradition on Mother's Day - although I have to add that my mother is not a sentimental type of person - so most traditions like that kind of got lost in our family! Have a Happy Mother's Day! Beautiful box! Stunning rose! Wonderful work! Such a pretty little box...I especially love the foam rose! 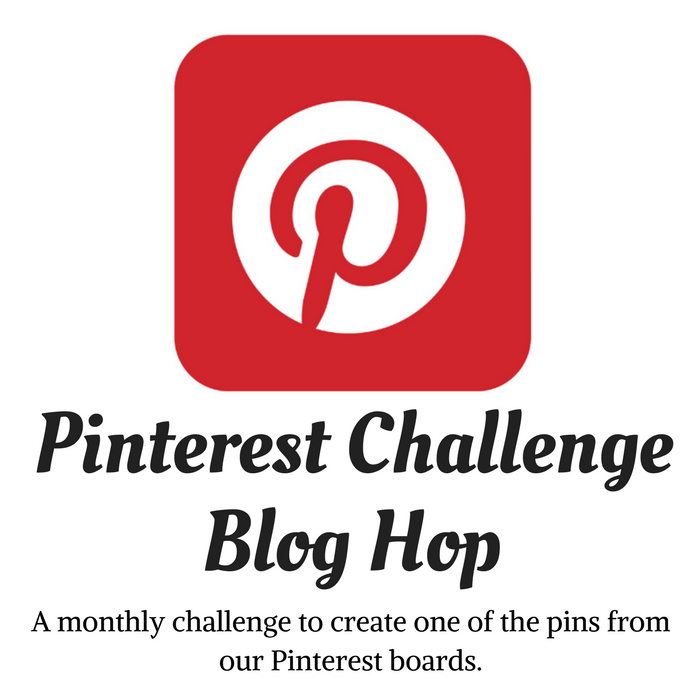 Thanks so much for linking it up to my Creative Ways Link Party!